For many years, Southern Sahara has conducted research to identify specific traditional design elements that are still relevant today, and are critical to the development of a modern architectural language for Africa. Once referenced in contemporary practice, these design elements become the foundation for creating successful architecture for the people of Africa, as they respond to the lifestyle, culture, aesthetics, materials, climate and geography of the diverse ethnic groups of Africa. The research findings became known as the Southern Sahara Signature Elements of Design, a discernible kit of parts for residential architecture, that when critically reflected in a design concept, achieved a successful prototype of contemporary African architecture. An architecture that is comfortable and culturally suited for the home owner. Defined in three categories: Culture-Lifestyle (floor plan functionality), Aesthetics (finishing and furnishing), Sustainability (materials, climate, cost). These Southern Sahara Signature Elements of Design became the foundation for the CPDI Africa Design Brief. To design perfect residential prototypes, of contemporary African architecture, that reflects the culture, aesthetics and sustainability for community design and development in today’s Africa. 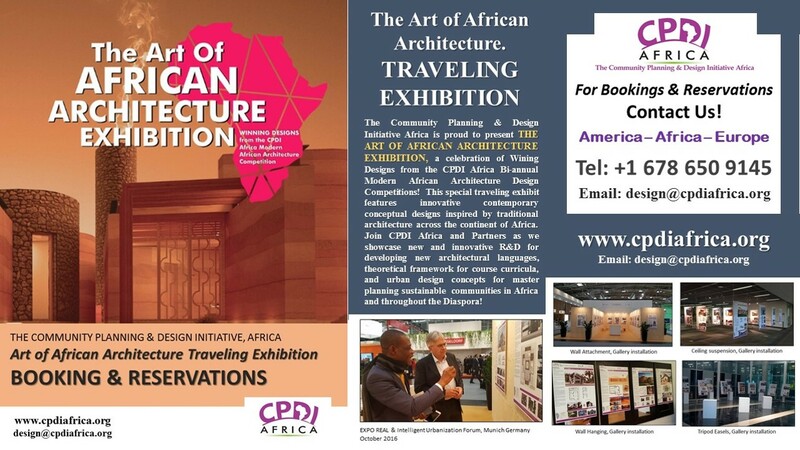 CPDI Africa participants may consist of an individual architect, or a team comprising of architects, artists, designers, and engineers. Participating team members will be required to provide supporting sources of inspiration for their contribution. Will research and reflect the philosophy of spatial configurations sourced from traditional architecture . Provide supporting literature and visual documentation of the concept inspiration. Will contribute to the visual elements and overall aesthetic of the prototype façade, textures, motifs and patterns. Provide the source of inspiration of any traditionally inspired elements, their meanings and origins. Will introduce building materials inspired by both traditional and contemporary methods found in Africa today. Provide visual and research documentation of the materials and respective construction techniques. Participants may enter the competition as an individual, or as members of a team. Members of a team may comprise of professionals or students from the allied professions. If participating as a member of a team, the architect will serve as Team Lead. Teams are limited to a maximum of 3 members. Practicing architects or architecture students will be required to provide valid information of their college, university, school of architecture or polytechnic. ALL individuals and Team members participating in CPDI Africa Must Register to participate on the CDPIAfrica.org website. Early Bird Registration / Discounted Registration Fee is available on the website, as of May 31st 2016! Participation Waivers will be Required (during the Submission Phase), for your wining designs to be built and or published. Participants will receive the CPDI Africa 2017 DESIGN BRIEF upon completion of the application process in January 2017. The 2017 CPDI Africa competition launches January 1st 2017.